Send this bold and bright rose bouquet when you want to fill that special someone's life with happiness. 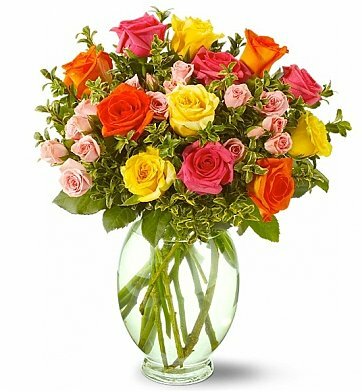 Our florists combine fresh-cut pink, yellow, and orange 60 cm roses and spray roses in a classic glass vase to create a look that is fresh and jubilant. Not only is the bouquet beautiful, but it smells great, too, and makes a wonderful choice for celebrating any occasion. Hot Pink Long-Stemmed Roses (60 cm). Orange Long-Stemmed Roses (60 cm). Yellow Long-Stemmed Roses (60 cm). Measures approximately 14" x 19". Happiness Rose Bouquet is a hand delivered gift. These gifts are delivered by one of our local design centers located throughout the United States and Canada. Same day delivery is available for most gifts when ordered before the cutoff time. The cutoff time for Happiness Rose Bouquet is 2 PM in the recipient's time zone.